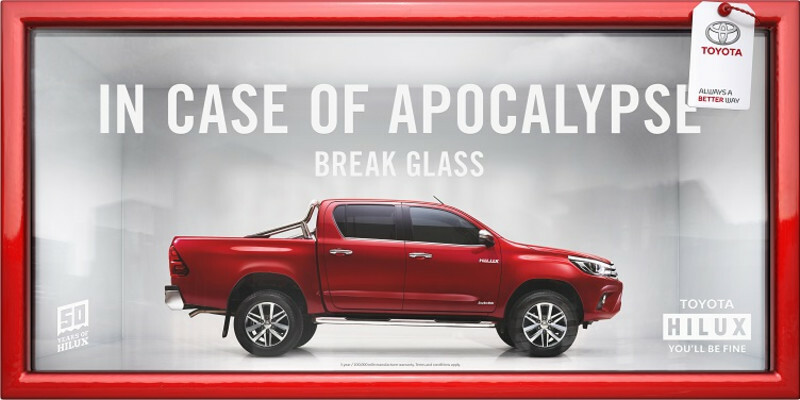 We are delighted to offer further report about Toyota’s extensive Hilux zombie testing programme. Unfortunately, under the Prevention of Nonsensical Hysteria Act 1968, Motorline cannot confirm or deny the presence of zombie virus (Vivi Mortuis) on British soil, but we do have centres across the south east, west and midlands that will be able to help. WE CAN ALSO EXCLUSIVELY REVEAL THAT THIS MODEL WILL BE AVAILABLE FROM JUST £296 PER MONTH WITH A £2,664 INITIAL RENTAL*. If you need further information about suitability of Toyota Hilux for The Event, contact your nearest Motorline Toyota centre today, before it’s too late. Thank you and we’ll sure you’ll be fine. Hilux Invincible 3.5t 2.4 D-4D 150 DIN hp Manual. Official fuel consumption figures in mpg (l/100km):Urban 34.4 (8.2), Extra Urban 44.8 (6.3), Combined 40.4 (7.0). CO2 emissions 178g/km. All mpg and CO2 emission figures quoted are sourced from official EU regulated tests. These are provided for comparability purposes and may not reflect your actual driving experience. Fuel consumption varies significantly depending on a number of factors, including driving style, conditions, speed and vehicle load. All models and grades are now certified according to the World Harmonised Light Vehicle Test Procedure (WLTP). From 1st September 2018, WLTP fully replaces the New European Driving Cycle test procedure (NEDC), which is the previous test procedure. Due to more realistic test conditions, the fuel consumption and CO2 emissions measured under WLTP are in many cases higher than those measured under NEDC. All mpg and CO2 figures quoted are NEDC equivalent. This means the mpg and CO2 figures are based on the new WLTP test procedure but calculated (using a standard European calculation method) to allow comparison with the current NEDC test procedure. More information can be found by visiting: www.WLTPfacts.eu. For cars certified under WLTP, revised CO2 and mpg figures are available from your local Toyota Centre on request. Model shown is Hilux Invincible 2.4 Diesel 6-Speed Manual at £31,830. Additional charges may apply on selected paint colours and finishes. Prices correct at time of going to print. 5 year/100,000mile manufacturer warranty. Terms and conditions apply. *Available on new leases of Hilux Invincible. Ordered and proposed for finance between 1st October 2018 and 20th December 2018, registered and financed by 31st March 2019 through Toyota Financial Services on Toyota Personal Contract Hire. Advertised rental based on a 36 month customer maintained contract, 8,000 miles per annum. Initial rental of £2,664 applies. All rentals are inclusive of VAT. Excess mileage charges apply. Metallic or pearlescent paint are not included. You will not own the vehicle. Other finance offers available but cannot be used in conjunction with this offer. Offer may be varied or withdrawn at any time. Participating Toyota Centres. Toyota Centres are independent of Toyota Financial Services. Indemnities may be required. Finance subject to status to over 18s. Toyota Financial Services is a trading name of Toyota Financial Services (UK) PLC; registered office: Great Burgh, Burgh Heath, Epsom, KT18 5UZ. Authorised and regulated by the Financial Conduct Authority. Terms and conditions apply.